According to a new study, Increased daytime sleepiness linked to the development of Alzheimer’s Disease. Analysis of data captured during a long-term study of ageing adults shows that those who report being very sleepy during the day were nearly three times more likely than those who didn’t to have brain deposits of beta-amyloid, a protein that’s a hallmark for Alzheimer’s disease, years later. The finding, reported in the journal SLEEP, adds to a growing body of evidence that poor quality sleep could encourage this form of dementia to develop, suggesting that getting adequate nighttime sleep could be a way to help prevent Alzheimer’s disease. It’s currently unclear why daytime sleepiness would be correlated with the deposition of beta-amyloid protein, Spira says. 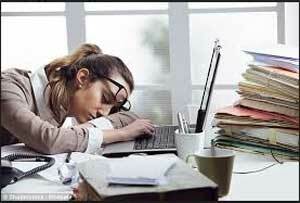 One possibility is that daytime sleepiness itself might somehow cause this protein to form in the brain. Based on previous research, a more likely explanation is that disturbed sleep—due to obstructive sleep apnea, for example—or insufficient sleep due to other factors, causes beta-amyloid plaques to form through a currently unknown mechanism and that these sleep disturbances also cause excessive daytime sleepiness.